All about your twelfth System, Field and Inner Aspect. 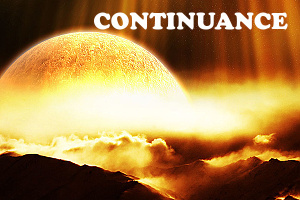 Continuance is the noun form of the verb to Continue, which comes to old English from the French, which is turn came from Latin. The Latin word means, literally, to hold togther. Continuance is the border between before and after. But it doesn&apos;tseparate the two; the action of continuance holds together the past and the future; the here and the there. How to meditate using the Breath of Continuance. This is also known as the Breath of the Golden Ray. This is the highest spiritual vibrational breathing technique that can be performed in the physical universe. It is not difficult to perform at all. From this place, your breath can heal and thus you can use it for healing. In this case beware of your breath and its odors that may possess smells youâ€™d rather not share with others. Before you use this breath ensure you either have no odors on your breath or it is pleasant enough to be smelled by others. All about the color of Continuance (ultra-violet C, or golden if that&apos;s easier for you to picture). The true color of System Eleven is Ultraviolet C, in the range of 280 nm—200 nm. This wavelength acts as a germicide and continuous overexposure to it can destroy the physical body. It isn&apos;t directly perceptible by Human eyes. So we represent it here as Gold (which, in true Crayola fashion, we shall deem a "color"). The &apos;sound&apos; of Continuance and how to use it. The sound of this System relates to joining all of the energies of the physical universe together as an integrated whole, It forwards the concept of continuity through a new realization of actuality and NOW. We are becoming whole in the present moments of life! Chanting or directing this sound consciously brings forth and promotes Coninuance. How to energetically change the past. Big concept, the past! It has different meanings for different people. Some people love to look at where they have been and process through old stuff and bring it all to a new light and an a-ha! Thatâ€™s why that happened that way! Or, yup, I see that now! This does not come easy for everyone. Some people hate history, old things or anything from the past. Some people have equated the past as having to do with dead things and old outdated, no-longer-needed things. How to practice the Acceptance and Oneness Experience techniques. In this workshop, you&apos;ve learned the I ACCEPT statement and how it applies to your Unifying Inner Aspect and Field, and your System of Continuance. This technique will help you surrender your fears and allow yourself to feel at one with the universe. And all you need is a drinking glass and a pitcher or bottle of cool spring water.